A report by Reuters described cuts by a flurry of analysts in the face of "industry data pointing to a fast-saturating segment," the same concerns that battered Apple's share price last fall. The report cited Byun Hanjoon, an analyst covering Samsung for KB Investment & Securities, as saying "I'd say most forecasters including myself had this conviction that they'll outperform again - because it's Samsung. They had beaten expectations before, which led many to believe they are bound to excel again with the S4." Samsung announced having shipped a record ten million units of the new S4 to its global partners, beating its shipments of last year's S3 model with a number that was also compared to Apple's Initial sales of 5 million iPhone 5 units. The difference was that Apple actually sold 5 million units in its first three days across just 9 launch countries. Samsung's larger number related only to carrier shipments, not end user sales, and included 60 launch countries, with Korea, China and India among that number, all major markets Apple didn't reach with the iPhone 5 in its initial launch weekend. Reuters incorrectly reported that Samsung sold those 10 million phones in its first month. Analysts caught up in the hysteria of the S4 launch initially predicted blockbuster sales of the device and continued momentum of sales, but are now backpedaling as actual sales data becomes available. "The S4, in reality, also lacks any real wow factor." The report cited analysts as pointing to "lacklustre prospects in Europe and [Samsung's home territory of] South Korea in particular," adding that "the S4, in reality, also lacks any real wow factor." It cited a report by Goldman Sachs analyst Michael Bang, who wrote, "The Street, including Goldman Sachs, admittedly extrapolated the first-quarter earnings momentum through the year. This resulted in very optimistic earnings expectations." Sales estimates by Bank of America Merrill Lynch have been cut by 5 million throughout 2013, but Reuters noted that "most analysts have reduced their estimates for S4 shipments to around 7 million units a month from their previous average expectation of 10 million." Even the loss of 5 million units would equate to a drop in $1 billion in operating profits, the report cited analysts as stating. In contrast, Apple sold 37.4 million iPhones in the most recent Q2 ending in March, beating Wall Street's institutional consensus of 35.86 million. Samsung has been trying to prop up sales of the S4 by experimenting with a flurry of models sporting smaller screens, even larger screens, ruggedized coatings and a fancier camera. The S4 is also accompanied by the Note phablet series and flanked by a wide range of low end models, many of which still run very outdated versions of Android. The more models Samsung produces, however, the more work it will assume in optimizing its designs and support across all of those produces. "I don't think there'll be as much buzz surrounding new product launches as it used to be." The company tried to warn analysts earlier in the year that it knew that easy sales in the smartphone market were drying up and that competition was getting tighter. "The furious growth spurt seen in the global smartphone market last year is expected to be pacified by intensifying price competition, compounded by a slew of new products," the Telegraph UK wrote in January, citing a Samsung report that cautioned, "demand for smartphones in developed countries is expected to decelerate." Going forward, analysts expect that "conservative forecasts will prevail," Reuters noted. "Expectations for innovation have been lowered," Hanjoon observed, "and I don't think there'll be as much buzz surrounding new product launches as it used to be." Apple has so far focused almost entirely at the high end of the market, only ever offering one flagship model of iPhone and selling previous years' models as its entry level options. That positions Apple very similar to the point it was when it only sold one version of the iPod, just prior to releasing the iPod mini and nano models that rapidly ate up the lower end of the MP3 market. Apple is widely expected to release a new lower priced iPhone model later this year, aimed directly at eating into the middle tier of smartphone sales. Reuters noted that "mid-tier models," currently "aggressively" targeted by "Chinese rivals" is "a segment in which Samsung has relatively weak positioning," noting that the mid-tier segment "accounted for less than 15 percent of Samsung's total shipments last year." Samsung also faces the threat of a broad U.S. import ban over multiple patent infringements, and two U.S. patent cases that involve monetary damages still being determined. 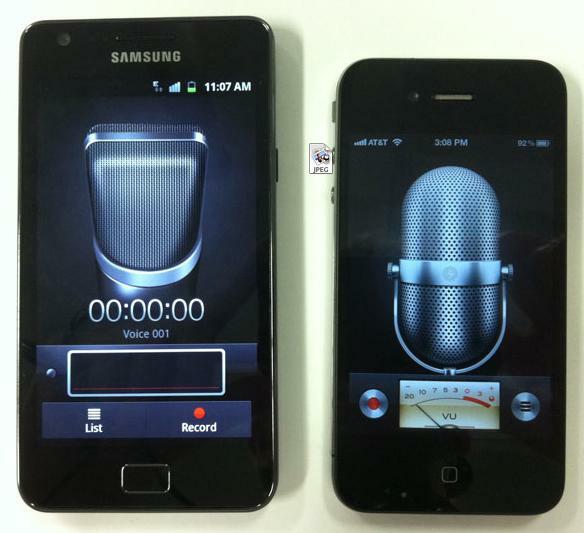 iOS 7 will force Samsung to redesign its software or look as old as last year's iOS. Apple's significant new redesign of iOS 7 will also force Samsung to either come up with its own parallel refresh or end up looking dated with a variety of features and app designs and its an overall appearance taken directly from previous versions of Apple's iOS.